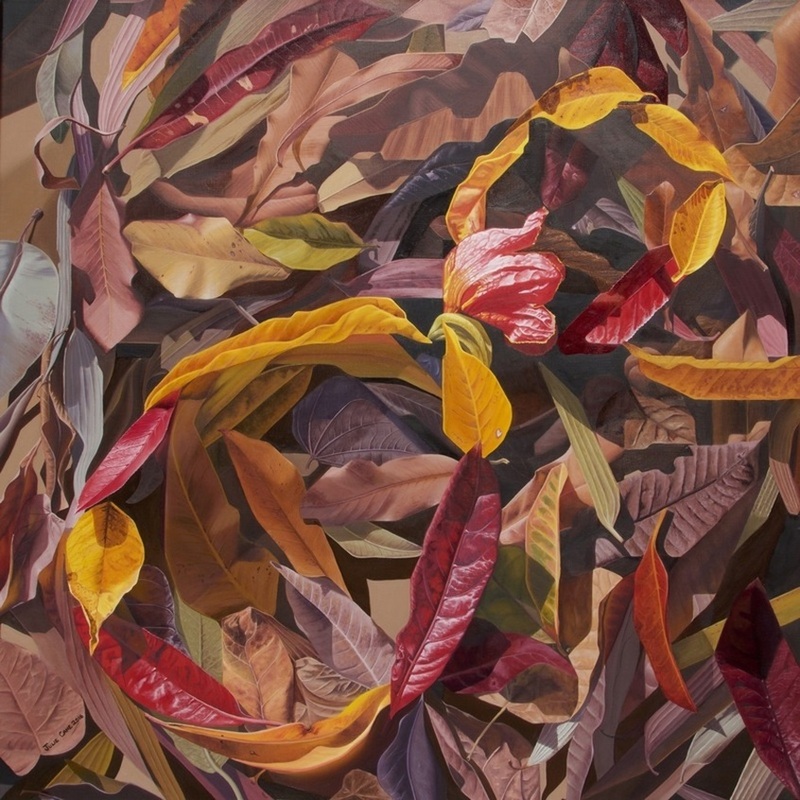 Infinity of Nature, an oil painting of leaves on a 100x100cm Canvas. In the beginning I grew up on a small farm in Essex, England, where we kept many animals and were surrounded by beautiful countryside, this I found constantly inspiring and I developed my love of the natural world, and my desire to protect it. I painted whenever I got the chance, around many obstacles and much discouragement, as was encouraged to focus on a proper career! Chocolate kept me going! In 2014 I won the Lethbridge Small Scale Art Award with Do You? My second oil painting of leaves. This picture was the first to sum up my core values, the need to cherish our Earth at all times. Small changes, when done by many people can make a huge impact. My leaf paintings highlight the balance in nature. Infinity of Nature is my largest leaf painting to date, it is 100x100cm painted in Oil on Linen. I started with a walk around my local suburb, collecting only fallen leaves that caught my eye, I brought them home and scattered them on a board a bit bigger than the size I want to paint, for this one I placed the bright leaves in the shape of the infinity symbol, on a background of more muted coloured leaves, to reflect on how mother nature, manages to reduce the leaves to compost, recycling and reusing their nutrients, in and ongoing cycle. Then I photographed it, as I cannot paint fast enough from life, to capture it before they alter, because even though they have fallen they are still changing with time. 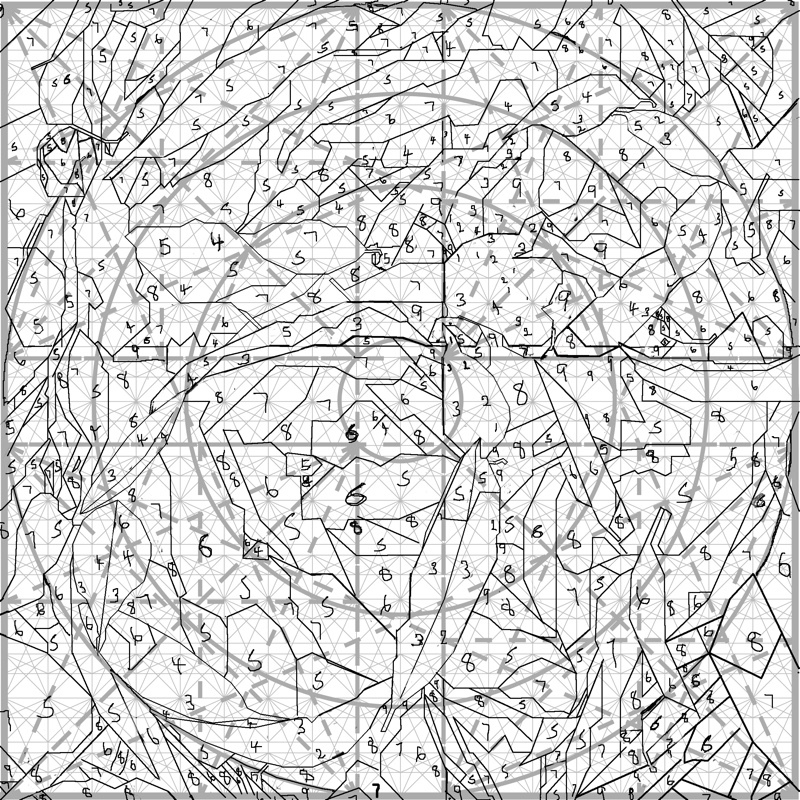 Once I have photos of my leaf composition, I used a root 5 grid for maximum energy inside a square for its stillness, (Contact Academy of composition for Grids and advice on using the grids). I adjusted the lay of the leaves to the grid to give the painting energy and flow. Once I had a suitable line drawing, I made a tonal plan to make the image read how I wanted it, lastly colour is considered. Once I had a complete plan, supported throughout by dark chocolate raisins from the local 'Source bulk foods', I transferred the line on to the canvas, then blocked in the main colours in their correct tonal levels, except the yellows, for these I used glazes to get the depth and tone I needed. The next 4 - 5 layers built up a depth of colour and detail in each leaf. Infinity of Nature captures my cares about the health of the planet, and cherishing its ecosystems, I do what I can to reduce my impact and recycle my waste. My paintings are each designed to reflect the worlds beauty at its best and to convey this message. Apple on Tour #1 - "Surfing"- The Story behind the painting. I had great fun with this one, and it is also a first for a couple of reasons. It is the first in a possible series of paintings for me and my apple touring Australia and it is the first wave-scape I have painted. It was great fun to work out, and fun to execute. The story begins with the apple being the first picture I painted, and a subject I have painted often since. I thought about this and decided it would be fun to take my apple on tour. This painting is of our tour to Mooloolaba, where the other apple of eye (my son) was the model surfer riding his board in the Mooloolaba surf. anything, I would love to hear from you. ​If you would like to buy it, it is on this link. Afternoon Stroll - The story behind the painting. 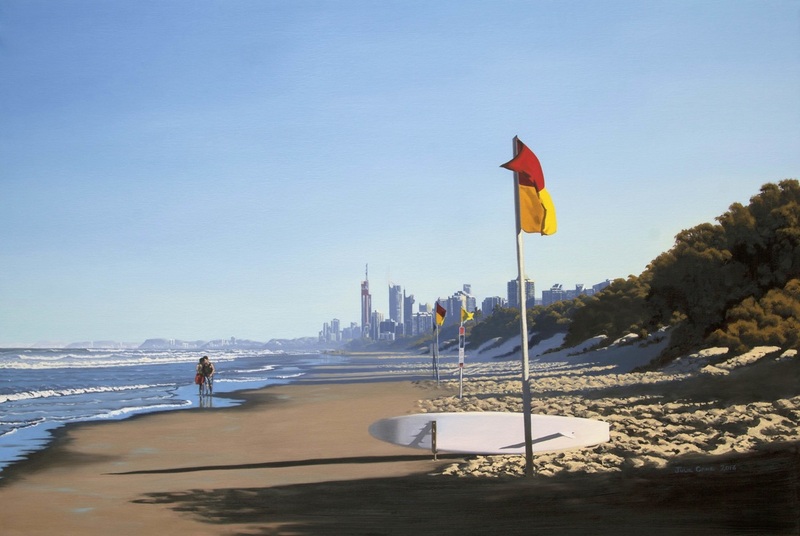 The play of light inspired me to paint Afternoon Stroll, a picture of Main Beach, Gold Coast, Queensland. I love the light coming through the dunes from the evening sun casting long shadows on the sand and distant salt mist from the ocean giving a sense of distance. The couple walking alone down the beach are delightfully lost in each others company, walking through the receding tide. The light on the lifesavers flags, just before the end of their stint for the day was a favourite and rewarding area to paint. My pallet consisted of the following colours French Ultramarine Blue, Cobalt Blue, Cerulean Blue, Cadmium Lemon, Cadmium Yellow pale, Cadmium Yellow, Cadmium Scarlet, Rose Madder Genuine, Yellow Ochre, Burnt Sienna, and Titanium White. The Hay Bale - The story behind the painting. The Hay Bale is based loosely on a photograph from our holiday to Yamba in January. I loved the way the light fell on the cattle. I did however take a number of artistic choices to improve it (I Think!) I tidied up the field and tried to get a greater feel of fields in the distance. I felt a change of breed was required for the cattle, so the Murray Grey looking cows became Herefords. I enjoyed this challenge of making a composition I love from a photo that I could see the potential, but would not on its own right make a painting. I had great fun arranging the elements in this piece, even the trees and the grass. I hope I have made something that you love too. My palette consisted of the following colours, French Ultramarine Blue, Cobalt Blue, Cerulean Blue, Indian Yellow, Cadmium Lemon, Cadmium Yellow pale, Cadmium Scarlet, Rose Madder Genuine, Yellow Ochre, Burnt Sienna, Viridian and Titanium White. Happy Days - The story behind the painting. Happy Days, is a tall narrow painting, that to be quite honest, I just could not resist painting. It is from a small section of a photograph I took on the Gold Coast. Although not my usual subject matter, I loved the bright yellow bouy sitting on the water, I love the clean edged reflections, and the light from the water reflected back up onto the bouy. I had a lot of fun expressing these qualities in the painting, I decided first on a composition and format of tall and thin with the Yellow bouy sitting near the top, I decided to paint the areas of the water as patches of flat colour, and to warm and darken the blues as they move down the painting. This was to give a sense of recession on the surface of the water. However I decided to paint the tonal structure of the bouy with soft transitions to give it is shape, and to reflect these soft transitions in the yellow reflections, while maintaining a hard edge with the flat colour of the blues. I like the look this has achieved, and I cannot help but smile when I look at this picture, it makes me happy, I hope it makes you happy to. ​Thank you for reading the story of this painting! I used the following colours - French ultramarine Blue, Cerulean Blue, Cadmium Lemon, Cadmium Yellow Pale, Cadmium Yellow, Cadmium Orange, Burnt Sienna, and Titanium White. Demonstrating at the Lethbridge Gallery this afternoon at one of their popular Sunday Sessions - Thank you to all those who took time out of their weekend to come and watch. As promised the main "how I do this" information from todays demonstration, this is just my method, there are many ways of using oil paints, find the way that suits you best. I have put this up as a blog, it is a first time foray into blogs for me, but it should make it easy to leave questions or comments - thank you for being interested, I hope this is useful! Composition is the most important consideration, above tone, colour and all the other considerations. All of these secondary factors have an effect on the composition , tone being the next most important followed by colour. Plan this, in some cases this may be the most time consuming part - it is worth the time put in at this stage! I set up the subject and try to get the lighting as close as I can to the desired effect, then I photograph and rearrange and rephotograph, until I am happy. This will often include looking at the images on the computer, where I can compare the thumbnails the computer (similar to doing tonal thumbnail sketches) to help assess composition and tonal balance, and even cut and paste elements before I make any permanent changes, like cutting flower stems! After getting the composition and lighting sorted and achieving a final photo or photos for reference, I will decide on the final painting size and format (though I will often have been working with a final size and format in mind). I work either life size or below, or largely magnified, just a bit bigger than life tends to look uncomfortable especially with portraits - people and pets! I produce a full size line drawing which I either do this from life or from the digital file on the computer. I use this opportunity to make any small changes, and correct any camera distortions if needed. I use some ready made but I am increasingly stretching pre primed canvas over a MDF board then getting it professionally stretched after I have painted it. If I use ready mades, I check they are actually square If I am going to get them framed afterwards, as some are quite out of square which makes them very hard to frame. also check they are not warped. I apply a couple of coats of Gesso to the ready primed canvas as I have found that some are not as well primed as they claim, and I can use it to smooth the surface further, I am still trying different canvases and linens. I also like the surface when I have gessoed it with W&N Galleria Gesso Primer. For still life I apply it initially with a large flat scrapper making sure there are no ridges left, depending on how it is looking I may do this a couple of times to get a smooth surface then I apply a final coat with a fine foam roller. For landscapes, where I prefer more texture in the canvas, I just apply the Gesso with the roller. I allow the Gesso at least 24 hours to dry out fully. I transfer the line drawing to the canvas, usually using a grease free graphite transfer paper, or by eye, depending on the complexity of the subject and the accuracy required, mainly it is a time saver. I rub away any excess graphite with a soft plastic eraser, then brush of any bits of eraser with a large soft brush. I select the colours for each painting before I start then stick to them, I try to limit to between 3 and 12 colours, usually around 6 plus Titanium White. This picture I selected 9 colours 2 Blues (Ultramarine Blue and Cerulean Blue), 3 Yellows (Indian Yellow, Cadmium Yellow and Cadmium Lemon) and 4 Reds (Burnt Sienna, Scarlet Lake, Crimson Alizarin and Permanent Rose) They are mainly transparent colours except Cerulean and the Cadmiums. 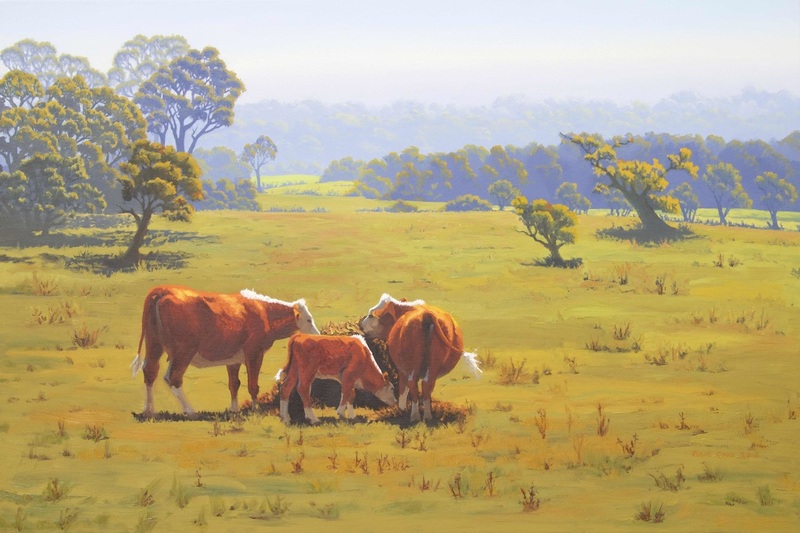 I use a medium of 5ml Linseed Stand oil with 15ml Zest-it and 20 drops of Liquid fine detail. I use this to thin the paint to a workable consistency providing good coverage, good control and leave a smooth surface, I work one leaf at a time putting in everything except cast shadow and small details (most of the time!) this takes around and hour per leaf approximately!! Set aside to dry preferably a fortnight, at least twice as long as it took to get touch dry, which will be longer than the first layer. I use a medium of 10ml Linseed Stand oil with 10ml Zest-it and 20 drops of Liquid fine detail. I add small details, glazes over yellow leaves, cast shadows and start to build depth into the colours. Pay particular attention to keeping glued transparent, and keeping pale colours out of dark glazes. Add any bright highlights. Set aside to dry preferably a fortnight, at least twice as long as it took to get touch dry, which will be longer than the second layer. I use a medium of 15ml Linseed Stand oil with 5ml Zest-it and 20 drops of Liquid fine detail. I refine any glazed areas that need more detail/depth, make any adjustments if required, finishing touches, often do not get to needing this layer. Set aside to dry preferably a fortnight, at least twice as long as it took to get touch dry, which will be longer than the third layer. Rarely used, but the medium I would use is 20ml Linseed Stand oil with 20 drops of Liquid fine detail. Set aside to dry preferably a fortnight, at least until it is touch dry then it can be varnished with retouching varnish available as a liquid or an aerosol. This will even out the surface which gives it a finished look. Fine artist working in Oil and Watercolour.